You must travel through the intersection at the posted speed limit. 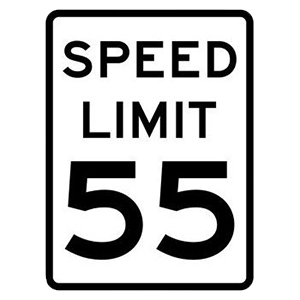 The maximum speed limit under ideal conditions is 55 mph. You must not travel below the speed indicated. Regulatory signs provide notice to road users of traffic laws that must be obeyed. This particular sign tells you the maximum speed limit for the stretch of highway where it is posted. You may drive more slowly than the posted speed limit, based on road conditions, but it is illegal to drive any faster than the posted speed limit. Operate any motor vehicle, regardless of its size or weight. Operate a vehicle with a gross vehicle weight of less than 26,001 pounds. Operate a vehicle with a gross vehicle weight of more than 26,001 pounds. With a Class C license, you may operate any vehicle with a gross vehicle weight rating of less than 26,001 pounds. Improves traffic flow by preventing collisions. Avoid "rubbernecking," or slowing down to look at collisions or anything else out-of-the-ordinary. This helps to relieve traffic congestion.